Seals Stadium, the Giants’ home their first two years in the city. They should have stayed there. Proving once again that human beings have selective memories, people are actually getting nostalgic about the imminent demise of Candlestick Park in San Francisco. How quickly they forget. The 49ers played their last regular season game in the ‘Stick last Monday, and you would have thought it was the finale for a really classy place, like Wrigley Field or Fenway Park. ESPN marked the occasion with a retrospective of highlights, Northern California newspapers and television stations chimed in with their efforts, and even The Wall Street Journal had a story on page one. 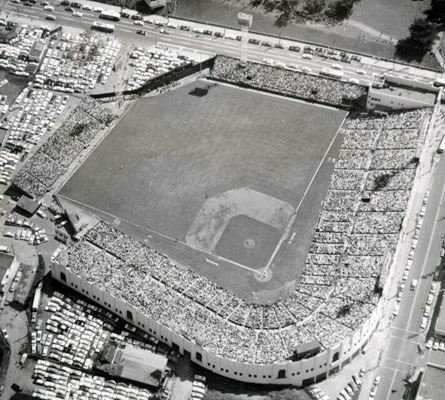 While the stadium was more recently known as the home of the 49ers, it was originally built to house the recently-arrived San Francisco Giants. San Francisco thought it had made the big time when the place opened in 1960. Wrong. The biggest problem was the location, one of the windiest spots in San Francisco. George Christopher (perhaps not coincidentally, the last Republican mayor of the city) said he had no choice because Candlestick Point was the only open land in the city that could accommodate the stadium and the 10,000 parking spots the Giants demanded. The Giants didn’t spend much time analyzing the site. Chub Feeney, then the team’s general manager and later president of the National League, took a tour of the half-built stadium one day and paused at what would be home plate to ask if it was always so windy. The park was supposed to have radiant heating in the box seat area, but that didn’t work, and the park was soon known as Harney’s Folly, for developer Charlie Harney. He sold the land to the city and then built the stadium. The outfield area wasn’t enclosed until the 49ers arrived in 1971, making the park a real challenge for right-handed hitters. It is safe to say that Willie Mays would have become the second player to hit 700 home runs if he had played elsewhere, and Candlestick became the laughing stock of baseball when Giants pitcher Stu Miller was blown off the mound before a national TV audience during the 1961 All-Star game. Awarded to only the hardy. The Giants’ marketing staff, confronted with the task of making lemonade out of a lemon, created a pin called the Croix de Candlestick that was awarded to every fan who stayed until the end of extra-inning night games. The place was hardly ideal for football. Niners center Randy Cross said he knew what shoes to wear on game day by looking at the tides as he drove down Highway 101. High tide meant a wet field; low tide a dry surface. To be sure, the park survived the 1989 earthquake and was the scene of many thrills over the years, but the biggest thrill for me came when I watched Dwight Clark make “the catch” in the comfort of my living room. I’d had my fill of Candlestick weather by then. This entry was posted in Sports and tagged Candlestick Park, San Francisco 49ers, San Francisco Giants. Bookmark the permalink. Boy, I don’t know how anyone could be nostalgic for the Stick, but I guess when a team like the 49’ers has a history like they do there, it makes sense. I know that I went to at least 10 baseball games a year (20 when I was a kid in Chicago and Wrigley was a short El ride) until I moved to San Francisco in the late 70’s, then stopped after two games at the Stick. I moved to San Diego and went to about 20 Padres games a year (usually when they were playing the Giants or the Cubs) at Jack Murphy for several years (including the 1984 NL Championship series to watch Steve Garvey break my heart). Then moved to Truckee and took my new wife to two Giants games in two seasons at the Stick and never went back. The “Croix de Candlestick” was an understatement.